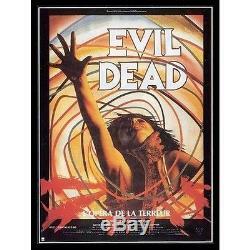 EVIL DEAD French Huge Movie Poster 47x63 - 1981 - Bruce Campbell. EVIL DEAD Original French movie Poster. Condition : Excellent (C8) little round hole in the black (2mm) on the top left, very discrete, otherwise near mint! Format (inch) - FR - 47x63 - One Panel Year - 80's Packaging - Folded Country - France. NOTE : There is a Watermark on the picture, "mauvais-genres. Com" is not written on the product. THIS IS NOT A DVD! 1 or 20 items, same price! Request for the total before paying. In case of Combine Rolled and Flat items the calculated price will be for Rolled. All the packages are insured and we provide tracking. Please read carefully the deion of the product, the condition is clearly mentionned. Mauvais Genres / Vintage Cinema Collection is a Online store based in France specialized in movie memorabilia, most of it related to "Genre" Movies : original pressbooks and heralds, signed photos and movie s, theatre-used movie posters, rare storyboards and great artworks, always in decent condition. We also propose a selection of interesting reproductions, for example a copy of a with an authentic signature, or the hand-made replica of a legendary prop. The item "EVIL DEAD French Huge Movie Poster 47x63 1981 Bruce Campbell" is in sale since Monday, May 02, 2016. This item is in the category "Entertainment Memorabilia\Movie Memorabilia\Posters\Originals-United States\1970-79". The seller is "vintagecinemacollection" and is located in Les Angles.